This conference season, talent acquisition and procurement lie in the forefront of our thoughts. Potential partnerships pile up and new opportunities lie in the palm of your hand via business cards and information sheets. But afterward comes the time to organize, reach out, and get to work. When that happens, how will your Procurement Department interact with your HR attendees? Will they interact? If any of the potential vendors become part of the supply chain, procurement gets added to the equation. D espite the differences between roles and responsibilities, HR and Procurement have a lot in common. Both are responsible for acquiring talent for the company in the form of employees, suppliers, or contingent workers. Both negotiate contracts on behalf of the company. As your HR professionals visit the next big conferences, potential contacts could blur together. There are plenty of benefits for streamlining the communication between your HR and Procurement Departments both before and after a conference. Established responsibilities between the teams means no one does the same job twice. With the presence of potential vendors at many of the HR tradeshows, your human resources professionals have a unique opportunity to cultivate new partnerships. Procurement should take advantage of their presence by communicating present needs. 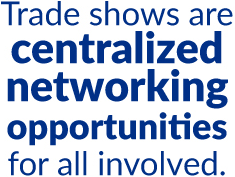 Trade shows are centralized networking opportunities for all involved, but both departments can’t attend every conference. Maximize your company’s presence by communicating the missing pieces from each face of the business. What went wrong with your previous background screening provider? What loopholes cost your HR team time and money? What other services could HR potentially need that a new background check company can contribute, such as drug screening? Could a member of Procurement or HR present a pre-existing contact from networking events to build from? These questions could apply to any third-party vendors, such as finances, transportation, delivery, and/or manufacturing products. An article by Matt Evans on theHRDirector suggests that HR and Procurement can also keep each other up-to-date on trends within their respective markets and the popular opinions of new service providers. Communication between these two departments, including an exchange of tips, data, and information, streamlines the process, which ultimately has positive results for your bottom line. The need for a productive relationship between HR and Procurement also lies in the rising popularity of hiring contingent workers. Staffing agencies can only recommend the right people for the job when they know the specific needs of your company and the key characteristics necessary for the jobs they’re filling. The field of procurement is changing, and this is the time to expand its reach within your organization. Make the most of this conference season with a system set up for procuring, adapting, and maintaining the biggest additions to your supply pool, a system where HR and Procurement provide expertise in all aspects of your business. Every chance to learn something new is a chance to move your company forward. Connect with us through social to share your thoughts!